Whey Protein Isolate, Whey Protein Concentrate, Cocoa processed with alkali, Natural and Artificial Flavors, Silicon Dioxide, Xanthan Gum, Salt, Soy and/or Sunflower Lecithin, Sucralose, Rebiana (Stevia leaf extract). Mix 1 scoop of WHEY FX Gold in 6-8 oz of water or your favorite beverage. No blender needed. Biologically active ionic whey protein (as concentrate), whey protein isolate, flavors (as natural, sodium chloride), sucralose & stevia extract. As a functional food, mix one heaping scoop of Whey FX Gold, to taste, in 8-16 oz of water or your favorite beverage. No blender needed. If you are pregnant or nursing, consult your doctor before using this or any other dietary supplement. Keep out of reach of children. Whey Protein Isolate, Whey Protein Concentrate, Natural and Artificial Flavors, Silicon Dioxide, Salt, Soy and/or Sunflower Lecithin, Sucralose, Rebiana (Stevia leaf extract). 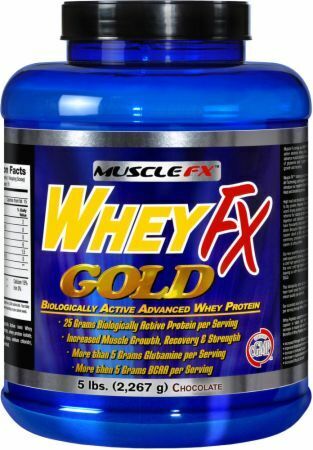 Muscle FX brings you WHEY FX GOLD, the new third generation biologically active advance whey protein. Muscle FX shares your commitment to your health and fitness. State of the Art Technology and Equipment has allowed us to pull ahead of the pack and introduce our registered Spray Dried Cold Processing, which prevents the High Heat and denaturing process. High heat and denaturing processing are the quickest and cheapest ways to dry protein. However, it should also be noted that extreme heat is the worst drying process for proteins because it ruptures ("denatures") and reforms the natural protein bonds into cross-links. This slows down the digestion and absorption process because these cross-linked proteins have thousands more bonds for the enzymes in your intestines to break down. * Because it takes longer for the amino acids to reach the muscles, it causes about a 65% less nitrogen retention. * Some proteins that are commonly processed with extreme heat are; egg whites, lactalbumin, casein, & whey protein. This biologically active protein is derived from milk produced by cows we have hand raised from birth on a special high protein and vitamin diet to ensure quality you can trust. Our scientists have further refined this formula by pumping in more protein per serving through Whey Peptide processing. What are Whey Peptides?